At this rate the Bugatti Chiron will be completely sold out in another year. The Bugatti Chiron is the definition of a dream car. A 1,500-horsepower successor to the iconic Veyron, only 500 examples of this extraordinary hypercar are being produced, and you need to have a salary on par with Cristiano Ronaldo to be able to afford one. One year after its debut at the 2016 Geneva Motor Show, Bugatti has confirmed that the 250th Chiron has now been sold. This means that half of the planned production models have already been allocated. It's an undeniably impressive feat considering that the Chiron was only revealed last year. Customers haven’t even been able to test drive it yet, though Bugatti will be hosting a central test drive event later this month. A whopping 37% of all Chiron sales were in Europe, making it the most popular region. This was also the case with the Veyron. Closely following behind Europe was North America with 30% of the Chiron's 250 sales. 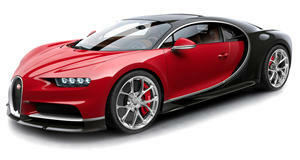 The Middle East also represents a key traditional market for Bugatti, with 26% percent of all sales. Deliveries of the Chiron to its privileged customers are set to commence in the next few days. Bugatti will be exhibiting an example produced for a German-speaking customer in a new exposed carbon fiber color known as Bleu Royal, with a two-tone interior featuring leather in Deep Blue and French Racing Blue. Bleu Royal is the latest carbon color option joining the existing choice of Black, Grey, Turquoise, Blue, Green, Brown and Red. And that's not including the 23 base colors available as part of the insanely intricate production process. If you’re in a position to buy a Chiron you shouldn't wait much longer. At this rate they will all be sold out by the time the 2018 Geneva Motor Show rolls around.